Last September, I met a prekindergarten child in the cafeteria at dismissal time. She was out of control. She hit a teacher, called one a mother $)(&@”#%*, and was just generally out of control. Yes, a prekindergarten student. Age 4. Today, this same child came up to me at dismissal and smothered my face with kisses. A colleague and I looked at each other and shook our heads. Is this child rehabilitated? No. She is in the office almost every day. But she’s better than she was. Categories: classroom management, Mentoring, Student Teaching, Teaching | Tags: Daily blog, weekly teaching tip | Permalink. It’s been a few Tuesdays since I posted a teaching tip. Now that the holidays have come and gone, I guess it’s time to get back on my Tuesday track, at least for today. Much has changed in my teaching world during the last few weeks. One of my interns decided teaching wasn’t the right path for her. You know what? I think she’s brave to know it and do something about it. Teaching is not for everyone. If it does not bring joy and a sense of accomplishment, it’s a good idea to reevaluate. Meanwhile, there are children to be taught. I don’t need no books. I ain’t checkin’ that out. I ain’t usin’ no crayon. You got colored pencils? I’ve changed a lot during almost thirty years of teaching. My reactions are fewer, but my actions are increased. I found a poem this child could read. No one can predict what tomorrow will bring. Don’t get caught up in the drama. Do your part. Watch. Listen. Help. Chill. Categories: classroom management, Personal Writing, Student Teaching, Teaching, Writing | Tags: Daily blog, difficult students, teaching | Permalink. 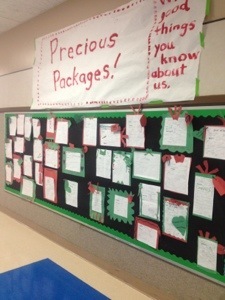 The last couple of days before Christmas break…the packages are filling up with kind words. I hope it helped. It helped some kids. They stop and read. They ask to write. I hope they’ll realize the power of positive thinking… for themselves as well as others. I hope it becomes easier to see the good. Christmas celebrations at school begin tomorrow. The kids will take their “presents” home. I hope they’ll read them often and remember the gift they are. Categories: classroom management, Encouragement, Photography, School Projects, Student Teaching, Teaching, Writing | Tags: anti bullying, art in education, positivity, self esteem, teaching | Permalink. Well, I stayed late last Friday (6:00 p.m.–tsk tsk) to get everything organized for this week; so glad I did because one of my interns called in sick at the last minute this morning. Even though I didn’t get to follow my own plans today, I was not stressed. I knew I had everything ready for when my routine is back to normal tomorrow. Preparation is a great stress reducer. Luckily, I was able to step in and take over today. But, for those days when everything really falls apart, an emergency substitute folder is a good idea. My friend DeeAnn taught me this about twenty years ago. Simply have a couple of pocket folders ready with assignments your students can do: writing prompts, a good poem to read and discuss, a review skill in math, a simple art project. Label each stack with a certain time increment, include a class roster and the schedule for the day, and you’re ready. No, it’s not as good as the teaching you would do if you were there, but it’s a lot better than being unprepared when the flu hits or a flat tire slows you down, or whatever other demon is keeping you from being at work. My interns usually have me as their “emergency sub plan,” but for the days they don’t, that little folder on a desk is a nice dose of peace of mind. Categories: classroom management, Student Teaching, Teaching | Tags: Daily blog, education k-12, substitute teacher preparation, teaching | Permalink. My bulletin board is bare, but not for long. Today, in the midst of another lecture about bullying, an idea materialized. The kids love it when that happens. They want good every bit as much as I do. So, we are going to start over in the morning. We are going to make paper presents to represent ourselves. We will leave the center blank and wait. Throughout the days to come, we will write positive comments on each other’s papers…true things that are positive and uplifting…words that represent what we add to the world by being here. Because we know…even in the midst of bad decisions and some words that shouldn’t be said, there’s plenty of good, too. We are set to find and record it until our presents are positively popping with preciousness. That bulletin board will be a reminder to all who pass by that we have many good gifts. I bet there will be a lot of reading going on at that board, too. 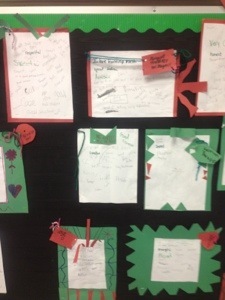 Categories: classroom management, Creative process, Inspiration, Journaling, School Projects, Student Teaching, Teaching, writing instruction | Tags: Christmas writing project, positivity, School, self esteem, writers | Permalink. Well, that’s the daily post question. A good one. I want my blog to show people that teachers are more than deliverers of instruction. We have opinions, and it’s ok to state them. We have lives outside of the classroom, and it’s ok to live them. There are many excellent teachers out there who are afraid to say what they really think. I would love for my blog to be a place people could come for a dose of encouragement, motivation, inspiration, and honesty. Every day is not perfect. Teaching is hard. I’ve never seen so much politics at play. How I hate games. We are asked for our opinion, then chastised or ignored for having one. We have a broken budget, but we pay motivational speakers to come encourage us and say things we already know when we really need time to work in our rooms. It’s not the world I live in. Teachers could tell a million stories…but we don’t have time. We are busy creating library check out cards for little kids so they can take our books home because those same kids lost their library books and can’t get any from the school. We are busy telling kids it’s not their fault that their parents split up, or their sister committed suicide, or their teacher down the hall died. We are busy teaching first grade skills to fourth grade students because we have to. We are busy hugging kids, and reading poetry, and thanking God for the good days when kids get it. I’d like my blog to be partly a place where those stories are told and readers still leave knowing I love what I do with children…I am an advocate for children and teachers. I am an advocate for the arts. 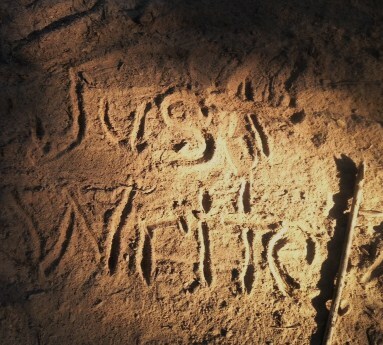 For writing. For photography. For books. For family. For friendships. I write this blog to keep track of parts of a year in my life…it’s become a challenge to write daily, to write honestly, and to record the good things in life, as well as the challenges. it’s a small change I made to the big world of blogging…just adding my voice. I would like my voice to represent those who don’t have time or energy to say these same things…to matter. Categories: classroom management, Creative process, Encouragement, Inspiration, Journaling, Mentoring, Personal Writing, Student Teaching, Teaching, Writing | Tags: change, daily writing prompt, DPchallenge, Education, teaching | Permalink. Intern #1 is sick. Fever. Intern #2 is sick. Vomiting. Teammate calls. Baby throwing up. It was one of those days, but the kids were exceptionally good, and we covered a lot of ground. 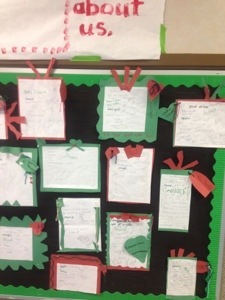 We wrote autobiographies, discussed election plans (they are excited! ), created thankful posters to display later in week, began division with remainders ( oh my, we need practice! ), and read and wrote pumpkin poems…and that was just this morning. Maybe the novelty of just me being there set the stage for improved behavior. We kept a steady pace, and of course, I praised a lot. A lot. Kids need to hear when they are doing well. See you tomorrow. Feeling much better. Teaching 37 kids all day long is draining. Categories: classroom management, Journaling, Mentoring, Student Teaching, Teaching | Tags: Classroom, k-12 education, teaching | Permalink.